Posted by Dan Deitsch on April 12, 2019 in News, Top Stories. 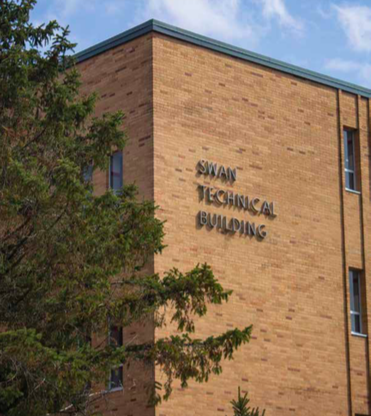 Ferris’ Swan Technical Arts Building enters its second semester of use after receiving an extensive expansion to its annex wing. The recent expansion extended the Swan Building out to approximately 22,600 square feet, giving students and faculty expanded laboratory space and better access to the latest welding and manufacturing technology. The welding engineering technology program received seven new laboratory spaces equipped with new welding equipment and technology. The Welding Engineering Technology program has expanded its incoming freshmen class size from 40 students to 60 students as a result of the new Swan Building expansion. The state of Michigan helped fund a portion of the Swan Building expansion as well. Every year, Ferris approaches the Michigan state government to acquire funds through the state capital outlay project. These funds can be used for renovations and expansions to campus buildings. Ferris originally proposed the $30 million Swan Building expansion project in February 2013, with Michigan’s state government approving the funds in 2016. The expansion initially opened at the start of the Fall 2018 semester and will fully wrap up construction at the start of the Fall 2019 semester. A ribbon-cutting ceremony will be held at the Swan Technical Arts Building Friday, April 26. The ceremony will run from 1 — 3 p.m. and is open to the public. Michigan Senator Darwin Booher, who helped the College of Engineering Technology secure the funds for the expansion, will be in attendance.